Exampla is the biggest additional event of the Munich fair. This show has been organised since 1970 with the purpose of introducing one section of arts and crafts and as wide spectrum of its creative expressions as possible. The show presents the final appearance as well as creation process of items exhibited. This year´s Exempla is devoted to the subject of glass – “a material between tradition and innovation”. Organisers invited some 30 exhibitors, individuals or firms, among them the glass school from Zwiesel, Germany. Individual exhibits presented blowing, smelting, engraving, cutting, painting on glass as well as special techniques such as making blown plate glass which is used when restoring antiquities. Bert Frijns from the Netherlands has developed a unique technology of plate glass smelting into a 3D shape. His massive vases have been both large in size and in aesthetic value. It is honour for glass from Slovakia that the glass designers - Zora Palová and Štěpán Pala, Eva Fišerová, Oliver Leššo, Patrik Illo and Lukáš Mjartan were invited to Exempla. They presented their works together with the Czech glass designers. The collection from Slovakia combined craft proficiency and highly valued art. The exhibition organised outside Slovakia has reminded us about the quality of the artists we have in our country. The studio glass design movement commemorates its 50th anniversary in 2012. To celebrate the anniversary, the Alexander Tusek Foundation has exhibited part of its international collection of glass design. 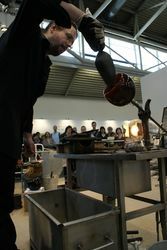 The Slovak glass designers attended other significant accompanying events. Glass artist Palo Macho presented his works at the Modern movement masters exhibition and Jana Machatová and Martin Papcún had their work presented at the Schmuck exhibition. Talents, a competition for young craftsmen under 33, is a sought-after event as it presents new and fresh ideas and proficient craftsmanship. Product design graduate Nienke Janssen from the Netherlands was among the newly awarded designers. She came with a noble cabinet on high legs from recycled plywood.